Jungle Scout is launching a new tool: the Jungle Scout Supplier Database. The Jungle Scout Supplier Database lets you find verified suppliers, match products to factories, and locate niche suppliers fast. The Jungle Scout Supplier Database is automatically part of the Jungle Scout Web App and costs no additional monthly fee to use. After testing the Jungle Scout Supplier Database in Las Vegas, sellers (especially multi-million dollar Amazon sellers) were blown away by the information the new tool provides. Learn more about the Jungle Scout Supplier Database. This is a huge, massive, awesome, amazing, fantastic, unbelievable announcement that I get to bring all of you today. The already powerful Jungle Scout Web App is getting an incredible new tool, unlike anything you’ve ever seen: the Jungle Scout Supplier Database. To call this thing a game-changer would be an understatement. A supplier that can manufacture/source your products fast and efficiently. How much actual business the supplier has done with American companies. Who the suppliers’ other customers are (including your biggest competitors). How much business those suppliers have done with your suppliers. The ability to match actual products with the supplier. And best of all, no “gatekeeper” to block access to all this important information. You can stop wishing now! The Jungle Scout Supplier Database does all that and more. How does the Jungle Scout Supplier Database work? 1 – Log in to the Jungle Scout Web App. 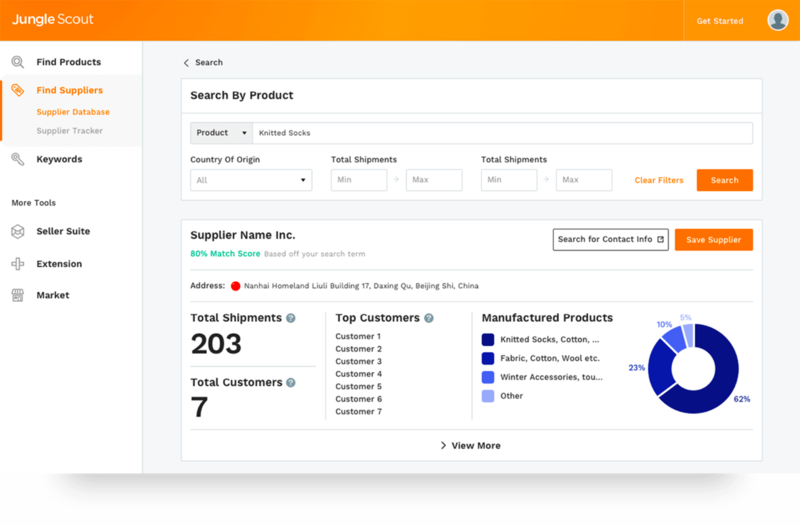 2 – Click the ‘Find Suppliers’ menu option in the left sidebar. Then select the Supplier Database sub-menu. 3 – Enter a product, company, or supplier into the “Source Your Product” search bar. 4 – Filter and review the supplier database. It’s that simple! Thousands of international suppliers available with just a few clicks of the mouse. How do I get the Jungle Scout Supplier Database? There’s a lot of companies out there that would charge a hefty monthly fee for this kind of information organized in this way. In fact, some of our competitors charge as much as $500 per month for it. But I’ve got news for you: the supplier database comes FREE with the Jungle Scout Web App. What else do I get with the Jungle Scout Web App? The Product Database – organize Amazon’s massive product catalog on your terms so you can find profitable product ideas fast. The Product Tracker – keep tabs on hot products and niches so you can see how products perform over time and come back to good ideas. Niche Hunter – filter through Amazon’s product database to find high opportunity products, removing the guesswork from finding your next bestseller. Keyword Scout – get actual keyword data straight from Amazon to build awesome Amazon product listings and effective Amazon PPC campaigns. Keyword Lists – save your favorite keywords with the keyword list and see how they perform over time. Listing Builder – use our tool to immediately populate the details for your Amazon product listing to ensure high clickthrough and conversion rates. The Jungle Market – find Amazon professionals such as product photographers, SEO specialists, IP attorneys and more that can help you and your Amazon business succeed. That’s right! You get all that PLUS the new Supplier Database. What are people saying about the Jungle Scout Supplier Database? We showed up at Prosper in Las Vegas to show off the new Jungle Scout Supplier Database feature. It was pretty scary–after all, there were multi-million dollar sellers in attendance there. Big, big sellers. And they were blown away! Make finding a supplier easy with the Jungle Scout Supplier Database. We can hardly contain our excitement! And I hope you’re as excited as all of us are at Jungle Scout. Today, with the release, we’ve got all hands on deck. Our onboarding folks, customer service reps, and even our marketing team are all on hand to make sure that the launch of the Jungle Scout Supplier Database is a 100% success. Happy hunting, Jungle Scouters, and have fun with this great new tool! If you don’t already have it, get the Jungle Scout Web App, now!